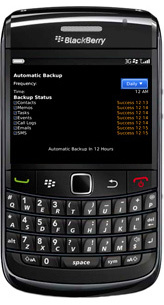 Protect your blackBerry with SmrtGuard Mobile Security.With SmrtGuard you get the best data and device protection for your blackBerry that includes call blocking, anti-theft & recovery, personal guardian and an easy way to find your missing device.You find lost or stolen smartphone and track it remotely via GPS through SmrtGuard.com.Remotely lock your smartphone to prevent unauthorized use of phone or data.Additionally you can block unwanted calls and create “blacklists” for those numbers.Emergency distress calls with a single button push on the smartphone.When activated, it sends out a distress email, SMS and/or phone call for help.Allow other trusted users (i.e. loved ones) to track the smartphone via the web.Great for parents to know where their children are.If an unregistered SIM card is put into the device,SmrtGuard sends a warning email and tracking turns on. yeap, this program is really useful, that's the first thing I installed on my storm when I unpacked it. But still it won't solve all the problems. For example, your mobile phone sends signals to the base stations approximately every 30 min and thus it reveals your location. Smartgaurd mobile security is just fine but I am using "Hotspot Shield" Free Mobile Security software for my android phone. It is the most reliable solution to hide ip location from snooper or for freedom to access any website of your choice.